A scholar from China visiting the University of Houston has been sitting in on my Saturday class. She brought this bookmark to me about three weeks ago. I got this heavy paper weight/book holder around 2005 at a small bookstore going out of business. Found these antique glass marbles in Abilene, Texas, in the attic at my great grandparent’s house around 1997. The picture doesn’t do justice at showing how many there are or how beautiful they are. This really awesome antique three-carat ring is also from Abilene. My great-grandmother gave this to me in 1997. This really neat and heavy-for-its-size elephant was given to me when I was a little kid (kindergarten or something) by a waitress at a small, “mom and pop” restaurant in Wallis while traveling to Austin with my mother. What are some of the cool objects you have? ‹ What you don’t know about restaurant surveys, plus a word to restaurant owners. Thanks for sharing Andrew! These are great! Very cool. Especially the marbles. Andrew, what a neat collection! I love all your treasures. Thank you so much for sharing them and the memories associated with them! One that I know I played with in my maternal grandmothers room aka “Nana” as a child, that I have no idea what exactly it is or where it came from but I love it. It has a round metal base from which many small metal wires branch out and at the end are semi-transparent birds. I love it, they look like they are flying. I also have a 6 pane wood panel window that use to hang in an odd little opening between our living and dining rooms in the house I grew up in. I have a collection of buttons from other states that were traded at summer meeting from when my Grandparents took us along on their “Ding-a-lings” trips ( Retirees from the Phone company who congregated together every summer from all over the United States, in a different place every summer). 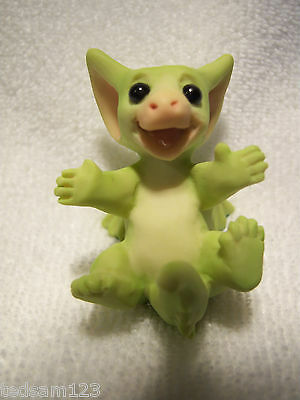 I also have 4 pocket dragons from a creator named Real Musgrave ( http://thumbs2.picclick.com/d/l400/pict/121576737541_/Pocket-Dragon-ROLY-POLY.jpg ).